We are pleased to announce the new Official Wechat Account of HEY! BELGIUM. HEY! Belgium is an Incoming Destination Management Company from Belgium based on 25 years of know-how in the food & beverages, event and tourism industry. 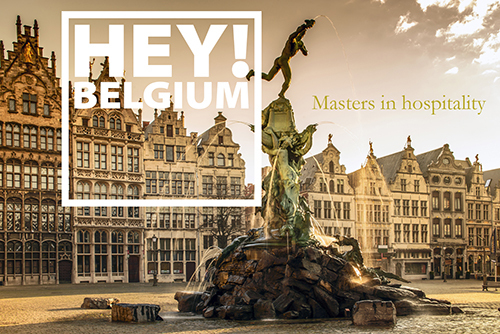 Visit www.heybelgium.be for more information about Hey! Belgium. MyChinaWeb set up the official Wechat account and is responsible for content management. The account – currently geared towards Chinese outbound tour operators – is used to showcase HEY! Belgium's travel products, as well as educate readers about Belgium. You can visit the Wechat account by simply scanning the QR code below or entering ‘heybelgium’ in Wechat. Horsten International is assisting HEY! Belgium with business development in China. One of Horsten’s business development managers in China has been appointed as representative of HEY! Belgium in China. Horsten proactively searches for new opportunities, communicates with Chinese tour operators, visits exhibitions, assists in translation and communication, etc.